It's tough being head of House Capulet; you have to run not only the day-to-day affairs of a powerful and influential noble house in fair Verona, but also the wardrobe and fashion choices of your fair daughter, young Juliet. It's almost as tough as having to deal with those nasty Montagues every day (a plague on their house!). Because renaissance fashions are always changing, and so are the tastes of teenagers. But fear not! We fine purveyors of attire are here to help, and we have just the thing for your little heiress. Nothing will suit her better than this beautiful Child's Lady Juliet Costume! Of course, this dress is ideal even if you aren't a member of a noble Veronese House. 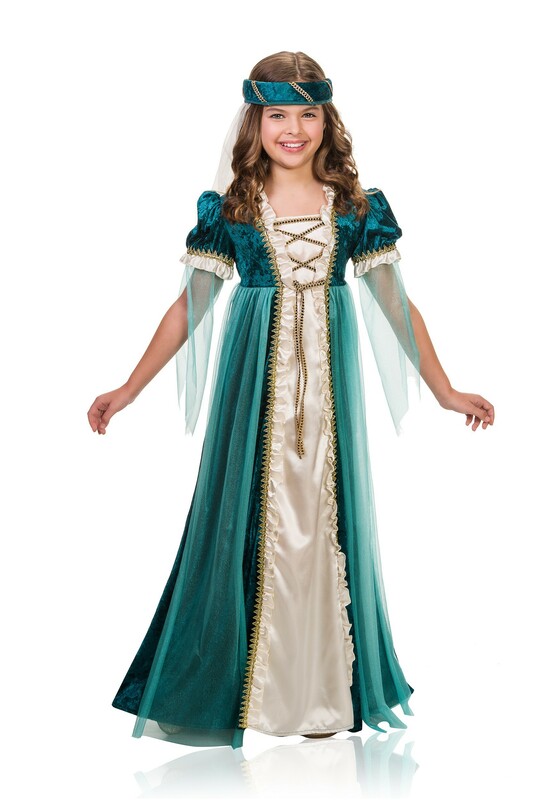 The Child's Lady Juliet Costume will turn heads in any school production of Romero and Juliet, at the renaissance fair, or heck, even on Halloween night!